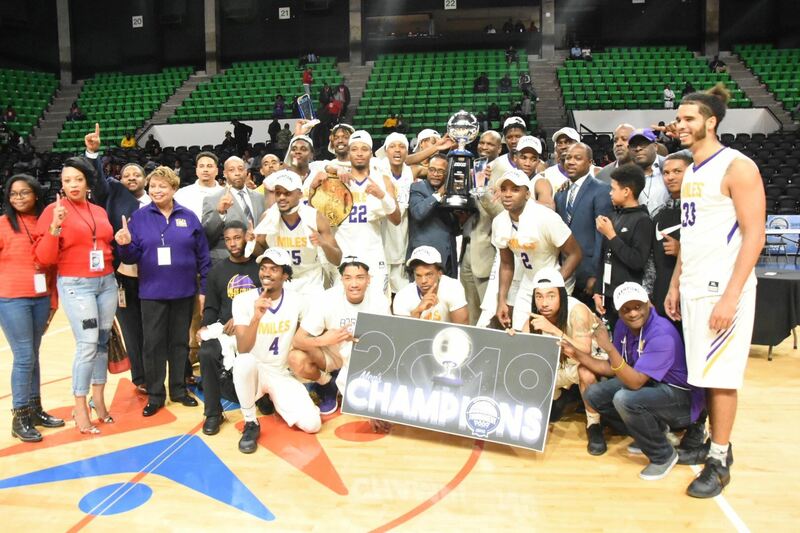 The Miles College Golden Bears completed a stunning one-year turnaround, dismantling LeMoyne-Owen College (LOC) 70-46 Saturday night at Bill Harris Arena in Birmingham to win their first Southern Intercollegiate Athletic Conference (SIAC) title. LaByron Harris had 19 points, five rebounds, two steals and two blocks to earn tournament Most Valuable Player honors as Miles (21-8) earned an automatic berth into the NCAA Division II South Region tournament. Miles’ trademark defense, which is tops in Division II in points allowed and field goal defense, was on display against the Magicians, who had averaged 84 points over their first three tournament games. LOC became the eighth opponent that failed to get to 50 points against the Golden Bears this season. But the offense went to work in the title game, and LeMoyne-Owen (19-10) did little to resist. The Magicians never led by more than three points, which last happened midway through the first half. But with the game tied at 15, the Golden Bears took control. All-Tournament team selection Jelani Watson-Gayle began a torrid stretch with a 3-pointer that gave Miles the lead for good at the 8:40 mark. For the next four minutes, LOC was blanked, missing its three field goal attempts and turning the ball over five times. Meanwhile, Watson-Gayle (15 points, five rebounds, four assists) drained two more 3-balls and Harris got a couple of buckets, the last as part of a 3-point play to cap a 16-0 run that put Miles ahead 31-16. The lead would grow to 18 before the Golden Bears went into the half with a 39-25 advantage. Any thoughts LeMoyne-Owen had about getting back into the game in the second half were quickly doused as its halftime deficit was the closest it would be to the lead for the remainder of the game. The Magicians missed their first six shots of the second half and buckets by Damian Archer, All-Tournament selection Devonte Fuller and Harris had the Golden Bears’s lead up to 20 points less than three minutes into the half. Miles shot nearly 50 percent from the field in the second half while LOC could only muster 31 percent, including misses on all six 3-pointers. The final four minutes were more a coronation than it was a competition as the entire Miles bench and the partisan crowd knew the celebration was imminent. With the win, head coach Fred Watson tied Kirk Patrick for the most wins by a head coach in his first season at the school and he took home honors as the top coach in the tournament. Tyrone Banks had 11 points and Tory Mason had 10 points and nine rebounds for LeMoyne-Owen. Archer (12 points, seven rebounds, five assists), Fuller (12 points, five rebounds), and Jose Roman-Angueria (six points, eight rebounds) had solid efforts for Miles.